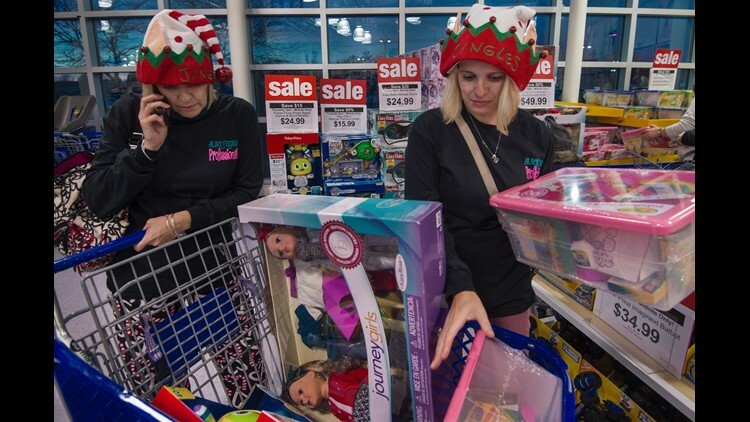 A mother and daughter team purchase toys at a Toys-R-Us store, and work on phone with a friend to double check the items they purchased in Fairfax, Virginia November 26, 2015. Toys are at the top of many lists this holiday season. Here are 20 deals that can help you finish your shopping! Did you know that Americans consume 40 percent of the world's toys? So it should come as no surprise that toys are at the top of many shopping lists during the holidays. "Legos. Legos books, lego bed sheets, lego sets, lego party plates (just to eat on) everything legos!" Felisha Diaz wrote. Diaz was one of several people who recently told us on Facebook that toys were among their most sought-after-items this time of year. "Paw patrol: sea patrol. My (12-year-old autistic son) asked for it," Amber Schweigert wrote. "First time he has ever really asked for a toy for Christmas. And its sold out at most of the stores around here." "A hatchimal for my (6-year-old) daughter!" Laura Woloszyn added. "She really wants one from Santa, but cost is way too prohibitive." To help you finish your holiday shopping list, we've put together a list of some of the best deals on popular toys we could find online. Scroll down for links. The deals were active and in stock at the time of publication. Click here to save up to 50% on toys at toysrus.com; sale continues through Saturday.